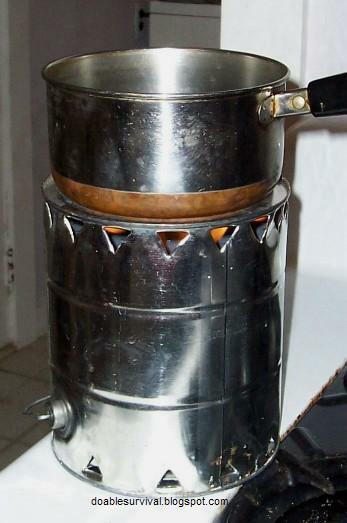 There are many different versions of "emergency heaters" and "emergency stoves". Today, I tried out the toilet paper emergency heater. Sounds funny, I know. This would be good for in the car if you live where you can get stuck in a snow storm or in freezing temperatures. You would need to crack the window open to not get too much carbon monoxide exposure. As with all DIY heaters like this, you need to be careful about carbon monoxide exposure and take precautions to not catch anything on fire. No brainer right? 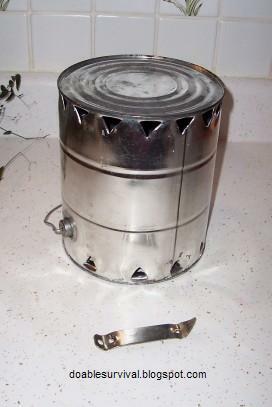 These aren't designed to heat your home, just a small area, enough so that you don't freeze or to heat water to sterilize it while camping or to cook with. There are many uses for it I'm sure. You want a small can, about, quart size (like a small paint can). Some paint stores and DIY stores sell new cans. I'm using a 29 ounce tomato sauce can, (yep, I'll be making pizza this weekend) which is also good because, for acidic foods like tomatoes and pineapple, they don't put a chemical coating on the inside of the can that can be toxic when they burn. You want to use unpainted cans. That wouldn't be as big of an issue for outdoors/camping, specially in an emergency situation. If you want a cover for it to control the heat or put a pan on to cook something, you will want a gallon-sized can, like a large paint can. You also need a roll of toilet paper and alcohol. Here's the fun part. 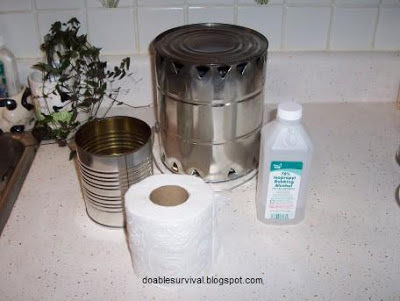 Squeeze the roll of toilet paper together and put it in the small can. If you can take the cardboard out easily first, do that; but if not, it should pull out easily after the alcohol is put in. 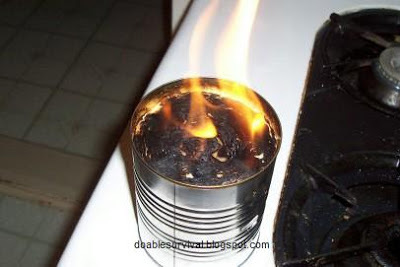 Now, fill with rubbing alcohol, denatured alcohol, or other appropriate fuel for an alcohol stove, leaving a little space at the top. (I'm not going to get into depth much on this subject as I'm not familiar with all the fuels that people use with these, and I can't afford to try a bunch. I just wanted to focus on the rubbing alcohol because I always have some in the house and many people do; and it's cheap.) Plus, who doesn't want to try setting a roll of toilet paper on fire?! lol You can put the lid on it and put it away for later use if you want to. Anyway, burning it full out without the large can over it, it burned for a total of over 2-1/2 hours, getting lower and lower. You could control the heat and make it last longer with the larger can over it. 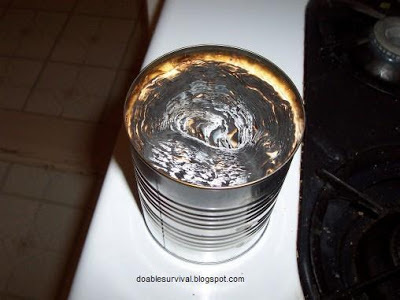 When you use the large can, you want to punch holes along the bottom edge of the can (which will be at the top when you turn it upside down over the smaller can). You can use a churchkey can opener (the ones that make a triangle hole). 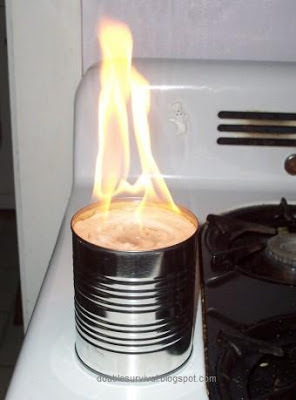 You want to, also, either punch holes along the other edge (that will be at the bottom when flipped over the small can) or make two vertical cuts to form a small door in a flap shape that you can raise and lower for more control of the flames. You could always cover some holes with tinfoil around the bottom to adjust the amount of oxygen it gets too. Less oxygen = less flame and less heat. Pot of water on top of the heater/cooker. "Frogs on a Raft" according to my friend Deb or "Toad in a Hole". Cut or tear about a 2-inch hole in the center of the bread. Butter the bread. 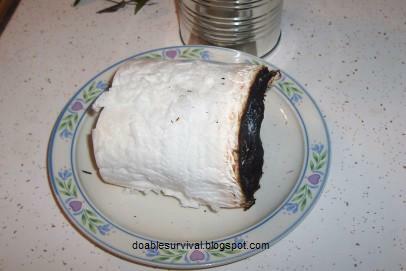 Put the bread on the camp stove top and break an egg in the center of it and cook it. Salt and pepper to taste. Coming soon, alcohol and buddy burners. Or is it alcohol and a buddy? Just kidding! Hmmm maybe I ought to rethink the title. Very cool idea I have seen these before and always wondered how they work. How long did it take to boil water? It heats quite fast. Of course, it depends on how much you put in there. I was impressed though. From what I've read, HEET or any methyl alcohol (or denatured) is probably safer to burn then isotropy alcohol. Thanks for the tip. :) I wonder what kind of chemicals are in the crepe paper though if it's fire resistant and if it's a good idea to burn it indoors? so awesome!! how long before you run out of fuel? I think this is the best idea for being without heat. Whether in the car or at home. Just remember to bring in a little fresh air. 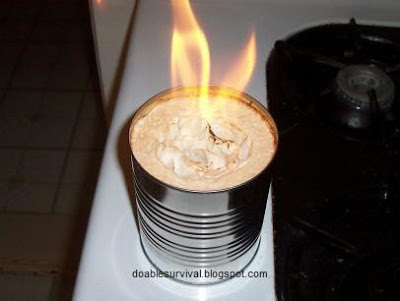 Great idea, I have a question:how long will a full can of fuel burn? I've heard of people using tp heater while deer hunting. I tried, not a good idea.It puts out smoke,smell and fumes. Deer probably ran to the next county.A couple hours of emergency heat ok. To take Deer hunting, very bad idea. Hello. Was it the70% alcohol or 90% alcohol that burned for 2-3 hours. I've checked CVS and they only have 40% r alcohol so that will burn for what 30minutes? I'm also surprised that r alcohol is 2.69 for 12oz, I thought it would be 2/$3 or even $1 like hydro peroxide is! I only tried the 70%. I couldn't tell you how long the others would last. Buy "Denatured Alcohol" at Home Depot, Walmart, Lowe's, etc. In the paint section. Carbon monoxide is more of an issue with inefficent (incomplete) burning than with an efficient burn. That's why a stove, furnace, etc. is "tuned" for the best (most complete) combustion. It's also worse with carbon based fossil fuels.